A £50 deposit once you confirm the dates required will secure your booking. This deposit will be retained as a damage/security deposit and returned to you once the holiday home has been checked following your visit. The full cost of your holiday to be paid 4 weeks before your arrival. Should full payment not be received 4 weeks before your holiday is due to start then we do reserve the right to retain the booking deposit. There is a dining area with table and chairs for 4 and sliding doors to outside. 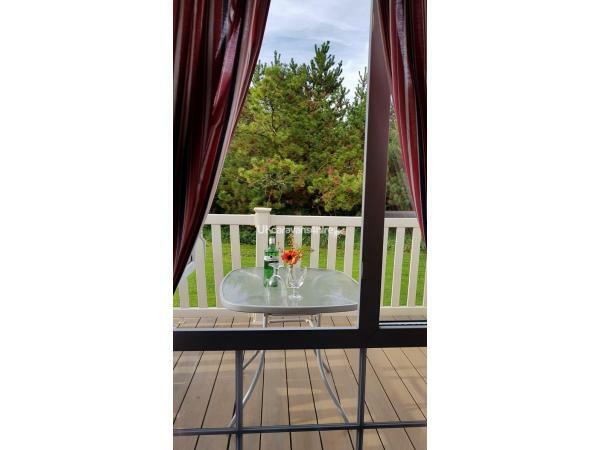 This leads to the secure outside decking area where there is also a table and chairs and to the rear of the caravan is a private secluded deck over looking woods. 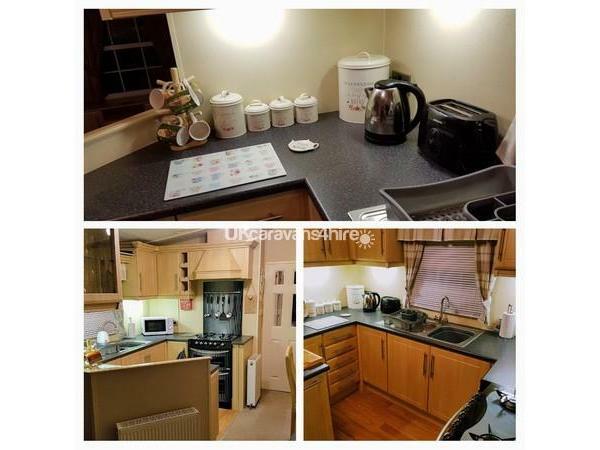 The kitchen has all the facilities you would expect, with oven and hob, microwave, kettle, Tassimo coffee make, large fridge and freezer, toaster, slow cooker. 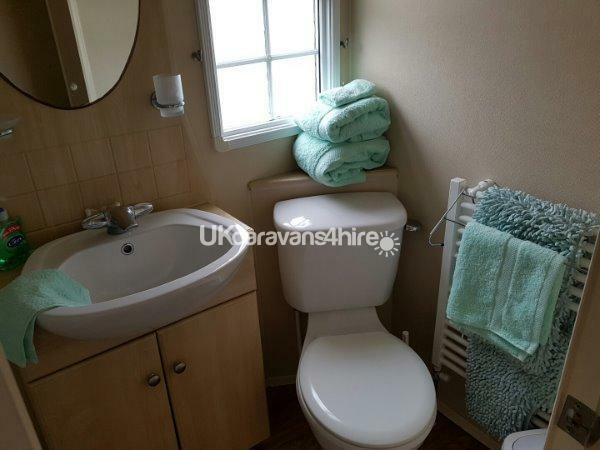 The main bathroom has a powerful, enclosed shower, w/c and basin. 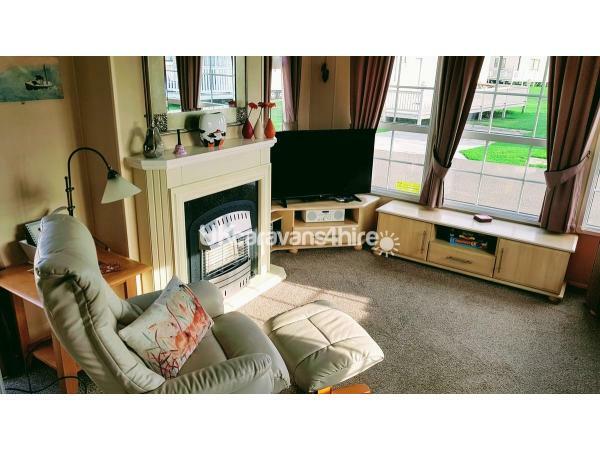 The caravan also has mains gas, and full central heating and double glazing throughout. 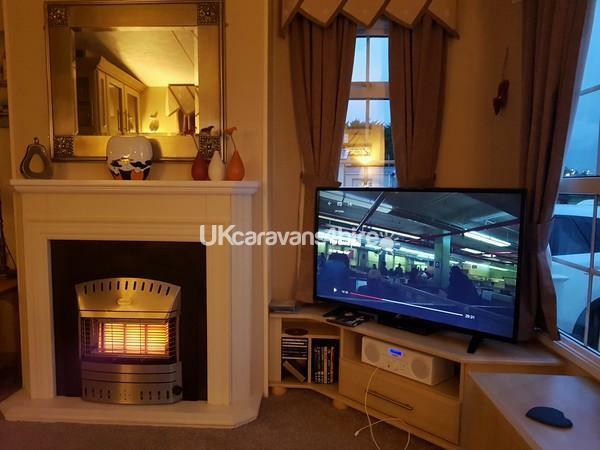 Located in the Finch area of the holiday park, within easy walking distance of the facilities on site and the beach, but also providing peace and quiet for those who just want to relax. We welcome up to 2 well behaved dogs with well trained owners. Doggy towels,dog bowls,spare leads and poo bags are there should you forget the essentials! The beach is dog friendly all year,although dogs are not allowed in the park's indoor facilities. We want you to enjoy your holiday to the full and know that you will enjoy your time at Cayton Bay. Just got back from a lovely break away. So impressed with everything could not fault a thing. Caravan was amazing! Super clean and very spacious. We took our little yorkie with us and he loved it. The nature trails and the trips to the beach were beautiful would highly recommend. Great value for money. Thankyou diana. Thanks for your great review and glad you enjoyed yourselves. We try to make our caravan a cosy clean and relaxing place to have a holiday for families and our dogs. Highly recommended. Our terrier loved the caravan and the holiday park, especially the beach! Located in a nice quiet area of the park. Couldnt want for anything in the caravan, even down to a slow cooker and doggy towels to dry off those sea paws! A lovely little home from home, enjoyed so much we have booked next year. So pleased you had a good time with your doggie and thankyou for your great review. Looking forward to seeing you again next year. Just needed to switch off after a hectic year and boy, did we! What a fantastic caravan!! It had everything you could ever imagine!!! Pure luxury!!!! My wife, myself and our two Chihuahuas ( Harry and Coco) really enjoyed our Christmas break!!!!! Top marks to owner Diana . Happy New Year.Phil & Maria Hill. Thankyou so much for your great feed back. We are so glad you and your doggies enjoyed Christmas at our caravan. We have just spent a week in this lovely warm and welcoming caravan. It certainly lived up to our expectations and was so clean and well equipped truly a home from home. Everything was so well organised from the booking to the key collection, a very friendly and efficient service, was so nice to have that personal touch. We all enjoyed our stay and are looking forward to returning next year. The fact it is pet friendly is an extra bonus and from past experiences of "pet friendly accommodation" this was such a refreshing change. Many thanks to Diane and Leigh for everything. Thankyou for you lovely review of our little home from home and you had perfect weather. So pleased you enjoyed yourselves and see you next year. Thankyou so much for your lovely comments and we are so pleased you enjoyed your stay. We like to think that it's home from home and that your stay should be comfortable, clean and relaxing. Just had a lovely few days, caravan was lovely and clean and had everything you could need, plus extra comfy beds! Thank you so much. We are so glad you enjoyed yourselves and hope to see you again I the future. Beautiful carvan, best we have stayed in!!! !so clean and welcoming, my young daughter loved the site and the beach is gorgeous. We will be definitely visiting again love the Ireland family. Really glad you enjoyed yourselves and thankyou for you lovely comments. We have been coming to cayton bay for the last 3 years, this was out first stay in Diane's caravan and we wasn't disappointed. It was the cleanest and best equipped caravan we have stayed in and value for money. We will definitely be returning. We had a fantastic stay here in April, and loved it so much, we have booked again for later in the year. The caravan was of a very high stanard and the owners have thought of everything to ensure a lovely stay, including the little essentials to get you started. Well maintained and very very clean also the beds were set up when we arived. It is in a lovely quiet location but within easy walking distance to all the onsite amenities. Communication with the owners was excellent, they should be very proud, highly recommend. 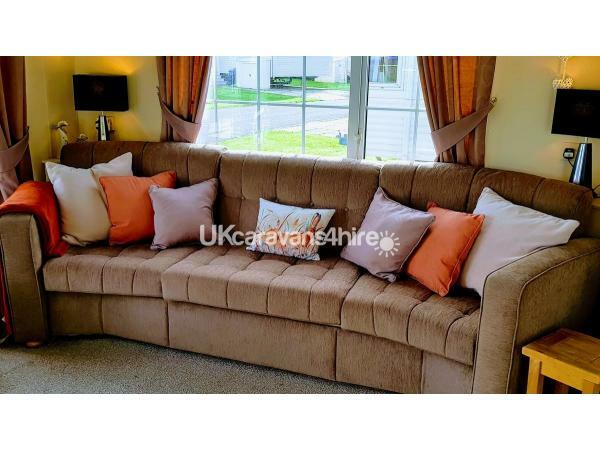 Caravan absolutely immaculate and very well appoinTed. Site clean and well serviced. Excellent location. We will be returning and would recommend this caravan to anyone. Particularly as dog friendly as well.